Texas Instruments published the original twelve games in their own boxes. 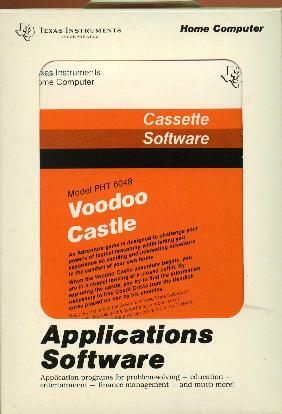 A cartridge containing the game-file interpreter was packaged with a Pirate Adventure cassette. The other eleven adventures were sold separately, but you needed the cartridge (called a "command module") to play any of them. The TI packaging was as plain and unremarkable as you can get, except for Mission Impossible, which actually had some cover art.